Imagine a spacious seaside apartment with poor connections to the views. That was just one factor of many addressed in this major kitchen renovation by experienced designer Kira Gray. "On this revamp, the existing kitchen had become dated, lacked storage and was shut away from both the lounge and sea views. 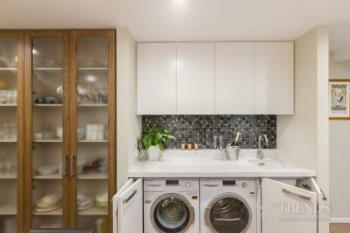 Accessed through one door, the space also included a laundry area that interrupted the kitchen's flow." 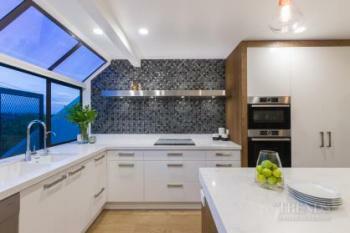 Besides accessing the sea views, the owners wanted the new design to feature a simple island with no inserts, offer plenty of storage, and still retain a laundry. It also needed to provide casual seating for two and have defined areas of use. "In terms of aesthetics, they wanted a warm, masculine look, with a bling factor," Gray says. 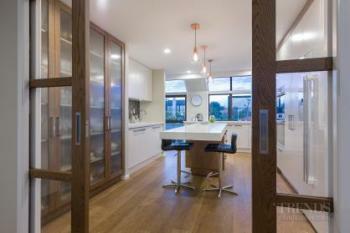 In response, Fyfe Kitchens' award-winning designer first removed walls, to create one large space. Wood and glass cavity sliders were installed at the entry to the kitchen, creating a direct view through from the lounge to the sea. "We positioned the cantilevered island with seating in the centre, to create a feeling of space," she says. "Plus, we lined the walls with tall cabinets, greatly enhancing storage options." Gray also reworked the prep and cooking zone, which now has flow, plenty of bench space and a riser downdraft behind the cooktop. The stainless steel light pelmet and angular cabinet handles are masculine touches while the wood floors, cabinetry and edging elements add warmth to the mainly white kitchen. The pelmet and mosaic splashbacks add the bling factor.